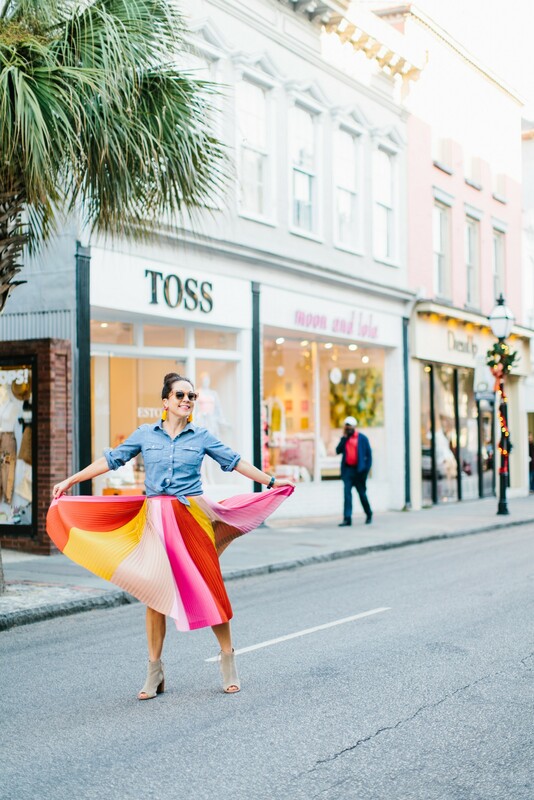 I had the pleasure of interviewing Liz Martin, founder of the Charleston Weekender blog and co-founder of Charleston’s only balloon & gift shop (Cannonborough Collective). Liz is on a mission to make every day feel more like the weekend, and loves to share the strategies that have helped her on Instagram with other entrepreneurs through her Intro to Instagram Growth consultation & class. Liz is known for her interior & product styling & has been featured in publications such as Houzz, Style Me Pretty Living, & Glitter Guide. I left my job as a speech-language pathologist in 2016, as my interior decorating and blogging side hustles were starting to take off. In 2017 a great opportunity came about to open a brick and mortar, so I took my online shop to a cute little boutique in downtown Charleston. Cannonborough Collective is a balloon & gift shop that I opened with a great partner, The Tiny Tassel, and we have a collective of over a dozen local brands! Instagram has helped my own online businesses & our shop tremendously, so I want to share that with other creatives as much as I can! My favorite thing to share is that it never hurts to ask. I’ve had the pleasure of working with the Aqualillies, a synchronized swimming group that has been featured in shows (like Glee), music videos, and movies. I didn’t think they would really see the benefit in working together with me, but lo and behold I’ve now done 2 shoots with them! This situation led me to meet one of my favorite bloggers, Kelly Lee of Kelly Golightly, and to get to work with some great hotels and vacation rentals as well. It truly never hurts to ask- so think of all you might be missing by not asking! I’m no one special, but I am not afraid of going for opportunities I want! I found a great website that allows me to sell t-shirts to fundraise, so I try to create a shirt campaign a couple times a year. I have helped raise money for local dog shelters & various suicide prevention/mental health causes. I also hope that my colorful Instagram helps inspire others to make their days feel a little more like the weekend, too! My mom has always taught me to always have something to look forward to, but it makes me sad that so many people are working for the weekend. What if you could find a little something in each day to look forward to- like smelling a great candle or being a tourist in your own town. My mom’s positive light that she shines on others really inspires me to try to do the same! My most exciting project right now is decorating a new home. Having a project at home to work on always helps keep me creative and overall inspired. It’s one of my favorite things to share with my followers that seems to really resonate with them. I hope that one day I’ll have my own vacation rental, so I’m always sort of gathering ideas and inspiration for that/keeping my eye on the real estate market! I’m also working on a side project with an interior design magazine for the fall, so I’m really pumped for that! There is power in numbers– When I didn’t have a large following, I tried to think about what I DID have instead- I had connections to a lot of other bloggers in my area. A company might not want to work with just you and your 1,000 followers, but what if you can pitch yourself as a group of influencers that will promote a brand? By leveraging followers on a collective basis (see #holycitychicks for an example of this), you can provide more value to a brand. You can also get them content that has a variety of different people to keep their own social media looking fresh, so that will save them money from hiring a bunch of models and doing separate photo shoots. Take What You’ve Learned and Charge to Share that Knowledge! I started tracking my rate of growth and which strategies were working as soon as I hit 1000 followers. A year later it was 10,000 followers, so I knew I could confidently help other people grow their business as well. There isn’t a day that goes by where I don’t hear at least one of my customers say “I have been following you guys on Instagram and had to come in the shop!”, and I know so many different kinds of businesses want the same for themselves. I created a 2 hour group class that I started offering locally, as well as a over the phone and in person consultation. It’s taken me a lot of time and trial and error to grow my own Instagram, so I am happy to share that knowledge with others who want to do the same without having to do the trial and error phase. Go local- If you have been posting about local restaurants and things to do as part of your blog or social media anyway, then you probably have racked up a majority of followers that are based in your area. Capitalize on this by reaching out to local restaurants & boutiques. You could help them plan an event and promote it on your channels, or you could wear their clothes and photograph & promote them. I have found that my ~20k followers is more enticing on a local level than to a national brand. Create your own online shop or brick and mortar– Bloggers are known for sharing about other people’s products (i.e. outfit of the day finds or beauty products). You can often get a paid sponsorship for this type of posting, or sometimes you can make about 10–20% from affiliate marketing. Wouldn’t it be better to make 100% off of the products you’re recommending? You can sell an e-course, or start selling products/services on your website. My first product was something that I think of as the “ultimate weekend companion”, Turkish towels. I usually just try to source products that I’m loving and using anyway, so when I promote them to others it’s genuine. It also pays more than affiliate marketing! You could also offer services, i.e. closet organization or styling services to your followers. They would definitely find value in that if they love your content! Content is Priceless! Creating content is something that so many companies struggle with. As an influencer, you probably already have access to a great photographer and you know how to get a lot of photos in a short amount of time. Look at other brands near you or that you already shop with. If it looks like they aren’t churning out many new photos very often, come up with pricing to style photo shoots and give them a set amount of photos. Don’t underestimate your power and skills as a “content creator”- many people find this to be a big hurdle with their social media and could probably use your talents. It would be a dream to have a Girl Boss breakfast with Mindy Kaling, Amy Poehler, & Tina Fey. If we did a co-ed gathering I would have to bring in Steve Carell & Will Ferrell for even more laughs. I would take the opportunity to grill all of them about having kids and a career at the same time, because this is something that I’m kind of terrified of juggling!